What comes to mind when I mention a banker with a motorcar? Don’t most bankers have cars? Yes, but you probably thought of the same banker that I did. Have you ever heard of little Lucy O’Donnell? You know Lucy. She’s Julian’s friend from school. Have you seen Julian’s drawing of Lucy … in the sky with diamonds? Some words and phrases stick in our minds forever. When they’re attached to universally known melodies, it’s difficult to even read the words without playing the music in our heads. That happened dozens of times as I read Steve Turner’s A Hard Day’s Write: The Stories Behind Every Beatles Song. Very few lyrics appear in the book, but song titles and even short phrases (newspaper taxis, blue suburban skies, yellow matter custard) launch personal soundtracks. Sometimes I feel I was born with Beatles music pre-programmed in my head. It’s always been there. Mention Blackburn Lancashire and I start humming the tune. I can’t help it. But these songs had to be written first. Where did they come from? What motivated John Lennon and Paul McCartney (and in some cases George Harrison and Ringo Starr) to pen more than one hundred classics? Turner can probably answer those questions better than anyone this side of McCartney himself. He conducted interviews with the musicians and many of their real-life inspirations. He also dug through countless resources to compile an exhaustive collection of lyric origins. John and Paul found creative sparks everywhere: newspaper stories, a vintage circus poster, an affair, a breakup, a Corn Flakes commercial. Often they’d be inspired by an interesting phrase. Paul latched onto the sound of “meter maid” after hearing it spoken by an American friend, just as he did when a chauffeur told him he was working eight days a week. Penny Lane, of course, was a neighborhood in Liverpool and Strawberry Field was an orphanage in Woolton. Some stories were familiar to me [Paul awoke with the tune for “Scrambled Eggs” — later known as “Yesterday” — in his head] but many others were complex [“A Day in the Life” was a combination John’s fictionalized account of a real friend’s death fused with Paul’s unfinished song about going to school in the morning], or simply strange [using intentionally confusing words, John strung together three songs-in-progress for “I Am the Walrus” to complicate the efforts of a schoolmaster seeking meanings in Beatles music]. I could go on, but Turner’s book tells these stories much more completely than I can. I found the origins endlessly fascinating for what they revealed about John and Paul’s musical abilities, too. Many times the rock-n-rollers would invent an entire song around a guitar riff or chord. Other times they would simply decide to write something in the style of Smokey Robinson, the Shirelles, Ray Charles, or Bob Dylan. Viola! Have you ever noticed the Beach Boys-style harmony in the chorus of “Back in the USSR”? There’s a reason it’s there. Turner arranged the songs in the order their albums were recorded. That gave me a further sense of the creative evolution and stylistic phases Lennon and McCartney passed through during the Beatles years. First published a decade ago, and reprinted recently with new interviews and facts, A Hard Day’s Write came to my attention only last month in a Seattle bookstore. All the songs are covered, though not all thoroughly. That was okay. 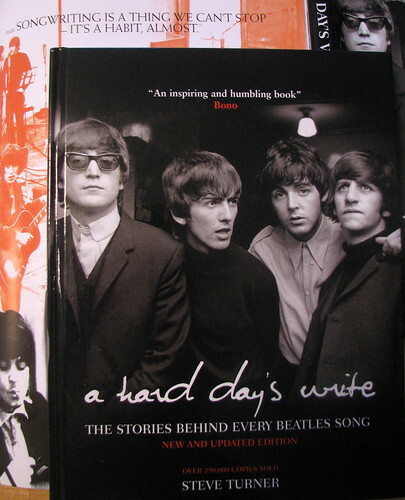 Reading A Hard Day’s Write was an extremely enjoyable trip through the Beatles songbook.